Born and raised in Southern California Brandon attended and graduated from the University of San Diego where he studied Business Administration with an emphasis in Finance. During his first year at USD Brandon was encouraged by a family friend to take an internship with a large regional insurance brokerage where he was teamed up with a seasoned Commercial Insurance Broker. Brandon realized during this time that becoming a Commercial Insurance Broker was the career path he wanted to explore upon graduation. 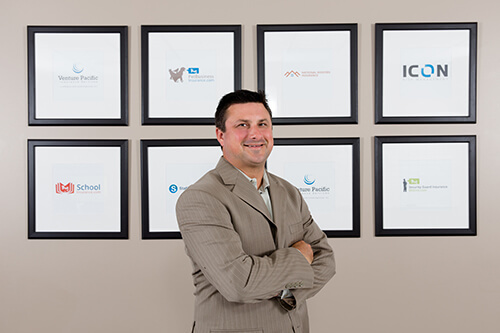 After graduating in 2001 Brandon began working as an Account Executive for Venture Pacific Insurance. Brandon currently focuses daily on growing and servicing his book of business that caters to the needs of contractors, manufacturers, and wholesalers in the Western United States. In 2013 after 13 years of hard work with Venture Pacific Brandon was recently named as a partner in the agency. His expanded role as Executive Vice President now includes sales manager and he is currently in charge of the marketing and sales efforts for the commercial lines staff. Living in Southern California he continues to enjoy the outdoors with skiing and his passion for the game of golf. He resides in Rancho Santa Margarita with his wife Kiley and two children.